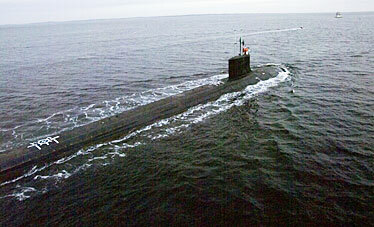 The USS Hawaii, above, will be joined by Virginia-class nuclear submarine USS North Carolina at Pearl Harbor in 2009. Six members of the Hawaii Army National Guard's Detachment 56, which operates a C-26 twin engine 19-passenger turboprop plane, left the islands Friday to begin training at Fort Benning, Ga., for its deployment to Djibouti to join the Combined Joint Task Force-Horn of Africa. The four warrant officers and two sergeants are expected to be on active duty for 12 months. The unit's aircraft also will be deployed to Djibouti, which hosts the only U.S. military base in sub-Saharan Africa with 1,800 troops. The unit supported recovery operations in 1992 after Hurricane Iniki hit the islands. Since then the unit has flown more than 8,800 hours ferrying National Guard personnel, cargo and burial details between islands. Lt. Gen. Franklin Hagenbeck, the superintendent of the United States Military Academy, will speak about West Point and building future leaders at 4 p.m. March 5 at Punahou School's Luke Auditorium. The speech is open to the public and is hosted by school junior ROTC program. Hagenbeck is visiting Hawaii to speak at the local West Point Graduates Association on West Point Founder's Day dinner on March 8. The USS North Carolina, the Navy's fourth Virginia-class nuclear submarine, will be commissioned May 3, in Wilmington, N.C., with Linda Bowman, wife of retired Adm. Frank Bowman, the former director of Naval Nuclear Propulsion, as the ship's sponsor. The North Carolina is one of three Virginia-class nuclear submarines that will be stationed at Pearl Harbor starting in 2009. The other two are the USS Hawaii and USS Texas. The fifth Virginia-class submarine will be named the USS Missouri. The Pentagon already has announced that two other Virginia-class subs will be named after the states of California and Mississippi. The Navy says the Virginia class is the first major sub designed specifically for the post-Cold War environment. Each sub costs about $2 billion.